One of the biggest challenges for any conference or event organiser is ensuring good ROI. Also, making sure that their event is well attended and supported. Achieving this is easier said than done. Yet, are you taking advantage of one of the largest opportunities for getting the attendance, return and support? You need this to make your event a success. Using Facebook to correctly market your event at precise times is a great way to get started. Marketing events on Facebook can prove to be incredibly effective. Given the size and nature of Facebook, it can be the ideal tool to improving your returns. According to WebHosting.com, Facebook has 2.23 billion active monthly users, making it by far the largest social network globally. Additionally, they state that as of May 2018, there were 80 million Business pages on the platform. With so many opportunities to engage, communicate and share with an audience, it is the perfect place to promote your upcoming event. 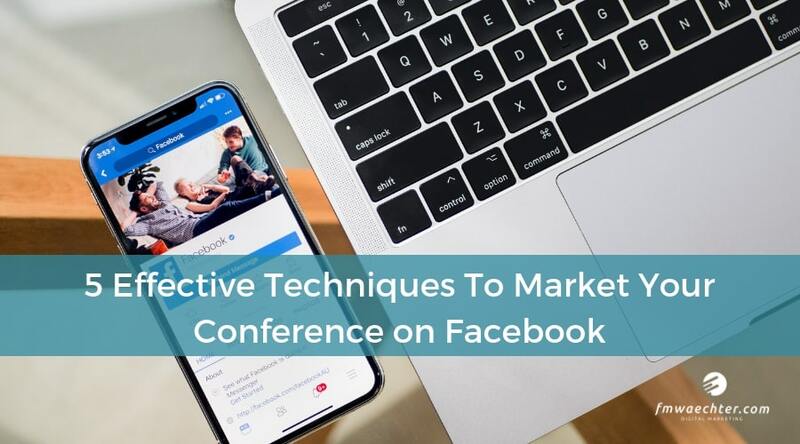 This quick and easy step is essential to making the most out of Facebook for your conference as it will help with overall awareness. After setting up the event, choose the right event name, cover image and then add the relevant details. Don’t forget to convey the right message about your event to your audience. Be mindful of the information you provide. Ensure to include your ticketing link so that it is easy for your audience to book their spot. When you create your event, you will be able to invite attendees from your Facebook friends list. A great tactic is to incentivise fellow industry experts or speakers at the event to invite their own friends or connections. This will ensure that your organic reach is far wider, appealing to people who are likely interested in your event. Additionally, when someone is invited to an event by someone they know and respect, it makes them significantly more likely to sign up and attend. Another great feature of Facebook events is that those who RSVP as “going” or “interested” will receive regular reminders as your conference draws closer. However, the most valuable benefit of creating a Facebook event is the free newsfeed placements that your attendees generate. When an individual accepts the invite to your event, it is automatically posted to their wall. As a result, their friends’ timeline, has greater organic reach for your event. Social Media is most effective when it is in fact social. Avoid using aggressive and direct sales techniques. Rather communicate the value that your conference can add to those who attend it. By giving them an indication of how they can benefit, they are far more likely to express interest or attend. When it comes to conferences, an effective technique for communicating value is by sharing content from previous conferences. Alternatively, provide a taste of what attendees can expect. Communicating what they will take away or stand to gain from attending your conference is a great strategy to attract attendees. Information from speakers or key topics that can create discussions online are great sources of content. Due to updated algorithms and Facebook’s changing privacy settings, it is harder than ever for content to be seen organically. Simply put, there is very little chance of someone who does not already like your Facebook page seeing your content organically. Running ads and promoting your event on Facebook allows you to reach more people and even sell tickets to your conference or event. The convenience factor when it comes to buying a ticket can be the difference between a ticket sold and an empty seat at your conference. So, keep this in mind when promoting your event. All you need is a few clicks on your event page to make a booking. Setting this up is relatively simple and the benefits can exceed your expectations! If you’re looking for increased awareness among people interested in your event, a targeted Facebook advert will help you reach them. Ensure you include all the information that your event can offer them! Whilst Facebook advertising can be competitive, the right balance of accurate targeting and excellent content can yield results far more effectively than traditional marketing. Although paid advertising is powerful, organic awareness is just as efficient if you can get it right. Why not recruit your followers and partners to help with awareness? This is achievable by enabling affiliates the opportunity to share and connect. If you have speakers or conference partners, ask them to invite their followers. Provide them with everything they’ll need in order to do so. This will take little effort from their side while boosting their credibility among their own followers. It’s a mutually beneficial method. Additionally, start a conversation. Include the social handles of your speakers within your event description. Attendees or potential attendees can then converse with your speakers or partners about the content of your upcoming conference. You can even go so far as to create an authentic hashtag for your event. The value in testimonials is boundless. Having customer reviews of your event is a brilliant idea. It can resonate with visitors who are unfamiliar with your conference or business. Include statements that epitomise the excitement of future speakers and past attendees. More so, loyal attendees that are enthusiastic about your upcoming conference. Use them to create visual content to share on your conference’s event page. You can easily do this by using a graphic-design tool website. Testimonials can be incredibly persuasive marketing tools for influencing potential attendees’ decisions to sign up for your event. It’ll also increase your credibility. If you’re looking for more specific advice or need some help with marketing your conference get in touch with us.